Endurance athletes think they represent the pinnacles of health with their ability to perform multiple sports longer than other mere mortals. As the miles get logged away (although only 45.5 percent keep training logs1), they believe their superpowers become greater and greater. They willfully subject themselves to the same, and sometimes more, insults to their immune systems as other athletes. This progresses nicely until suddenly it seems they find themselves sick, unable to tap into the top gear, unable to be at their best. 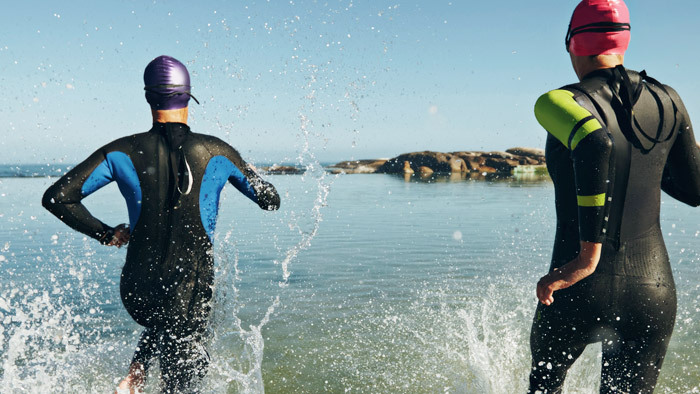 Toward the end of last year, triathlon research stalwarts Veronica Vleck, Gregoire Millet, and Francisco Alves published a review article of all of the possible health effects of triathlon training and racing that have occurred in the research literature. The original paper can be found in the Journal of Sports Medicine (New Zealand)2, providing many insights into how the immune system may be affected by the level of activity in which an athlete is engaged. Through several different mechanisms, the immune system may be depressed during intense endurance activity, resulting in a loss of superhuman abilities. Interestingly, though, many of those same “negative effects” from training might actually be associated with adaptation. Some of the interesting observations the team found in analyzing the literature will be highlighted here, along with practical, research-based methods for minimizing illness during the thick of training, some of which may surprise you. While the review article provides wonderful insight into what has been found through research, it only shows that part of the puzzle. Coaches, physiologists, and their athletes all see different degrees of empirical evidence that they may feel under the weather. It appears that when we track athletes, the rate of illness in competition season is between 35 and 38 percent3. While that may compare favorably to the general population if we assume a competition season of 3 to 6 months (the average adult experiences 2 to 4 colds annually4), endurance athletes are seeking “optimum” health, not just “better” health. I submit that even this is not good enough. This is especially true if you are an elite athlete reading this article whose livelihood depends upon your body. Endurance athletes, by the nature of their training, put themselves in danger of a decreased immune response. According to one study, triathletes may show a decreased number of monocytes and white blood cells5 (WBCs, disease-fighting immune cells). A drop in the number of leukocytes (WBCs) to below 4000 per microliter of blood is often tied to an infection. This infection could be otherwise undetectable and essential to combat if it lasts for too long, especially when compounded by other stressors. The research team also highlighted that an increase in intensity of running, even more than cycling, was correlated with an increase in upper respiratory tract infection (URTI) and increased congestion6. It also appears that decreased immune function occurs quite frequently in the window immediately after a competition7, increasing again the susceptibility to URTI. It’s still even a possibility that prolonged intense training could result in DNA damage8. What are we to do to maintain and even fine-tune our abilities? Methods to attenuate the negative impact on the immune system vary from increased monitoring of the body to nutritional interventions. More exciting methods will be continuously coming down the pike as more health-tracking devices enter the market. The stress of training and competition has a great impact on our ability to fight infection. It appears that intense training depresses the immune system to a greater extent than does moderate training. This is according to the position statement9 published in 2011 in Exercise Immunology Review on the association of immune function with exercise. Those feelings of malaise and fatigue that occur after intense bouts might actually be related to increased levels of inflammation markers10, same as occur during URTIs11. If this stress continues or worsens, ignoring the consistent signs of what scientists call “non-functional overreaching,” the effects could result in overtraining or, worse, adrenal fatigue. Adrenal fatigue is essentially when the glands on top of your kidneys give up on trying to produce enough hormones to keep up with the stress in your training and/or life in general. The Adrenal Stress Index12 is a list of what to monitor that includes levels of IgA, a marker for your recent exposure to pathogens. A basic blood panel will reveal pertinent information in this regard. Psychological stress has been shown to suppress our immune system13 and given the stress related to competition, it follows that we would have an increased risk of infection during these times. Taking care to track your stress levels and even take control over our responses will help us to ward off infection. One unconventional method for improving stress tolerance is the timing of periodic exposure to the cold. Cold thermogenesis while swimming or in the shower will also help fight stress and harden the body to fight better in the future14. While this may not prevent the cold, it will certainly enhance your ability to deal with it and knock it quickly. Measures of morning heart rate variability (HRV) have shown promise in revealing increase susceptibility to illness and even injury in athletes, particularly in swimmers15. In fact, URTIs are roughly one week from their onset when an athlete sees a sudden rise followed by a sharp fall in HRV over a couple of days. Tracking this variable daily is quickly becoming a more common method to assess readiness to train based upon nervous system fatigue. Plus, it utilizes tools that most endurance athletes already own (i.e. a heart rate chest belt and a smartphone). Better nutrition will generally improve16 our ability to fight infection. But what do we do as endurance athletes seeking to eek out the last bit out of our bodies? Yes, we can take our multivitamin supplements and they may improve our abilities to fight infection17 (well, not always18), but we are looking for the best of the best. Hyperphysiologic doses of specific vitamins, especially vitamin C, lack consistent support19 in the research, though many still swear by them. Many endurance athletes have turned to low carbohydrate diets in an effort to decrease inflammation and fight disease. This has worked for many, though ultra-marathoners training on a low-carbohydrate, high-fat diet do not necessarily see mitigated inflammation20 as many may believe. However, the optimal strategy for health and performance I think has yet to be elucidated21. Further, previous research found that intense exercise in a glycogen-depleted state does have a negative impact on circulating stress hormones, leading to decreased immune function22. It is my opinion that training in a depleted state is not necessarily detrimental23, so long as it is timed correctly and used appropriately. I think that glycogen-depleted training can serve to increase our toughness and resilience, even strengthening our immune systems24. Fasting actually improves our immune system and protects our brains25 even without the added running or activity26. I suggest timing these depleted sessions in the beginning of the season before the training becomes too intense or the necessity to perform at a high level increases. Place these sessions early in the morning in a fasted state, either fully rested or after an intense session the previous evening, depending upon the adaptation you are seeking. Scientific studies continue to reveal the connection between the immune system and gastrointestinal function27, with increased damage to the gut resulting from endurance running. Generally, protein intake that matches your individual requirements will help to optimize your ability to recover, which by extension, means your ability for your immune system to tackle inflammation. Specifically, the amino acid glutamine has positive effects on the lining of the gut28 and immune system function29 because of its prevalence in the blood stream and in intestinal tissues. Check out Ilana Katz’s entry30 about protein intakes related to immune function on this same blog. Bovine colostrum has seen several research inquiries, with many of them turning out positive results. In particular, the consumption of colostrum surrounding31 a particularly intense training block aids in maintaining the integrity of both the lining of the gut and the immune system, causing a reduction in risk for URTIs. Of course, the fully story of the link between the gut and the immune system32 is only in its opening chapters. The topic of how exercise affects your immune system is necessarily complicated. Make sure to take practical steps to find out more about your body and its reactions to various stressors. See your physician to obtain a baseline on your immune function and repeat blood tests periodically, at least once per year. In the interim, measure your stress responses using HR variability paying particular attention to when there are large fluctuations in scores related to food, exercise, or exogenous stressors. Take tangible steps, incorporating stress management techniques, and engage in “hardening” activities, to improve your resilience. Improve your nutrition and ensure an appropriate protein intake. Explore each of these topics in greater detail to endure at the pinnacle of health throughout your season.